Read more about Conference: "Cyber Security for Critical Infrastructure: Strengthening Confidence Building in the OSCE"
On 24 March 2016, during the International Spring Course hosted by the Inter-University Centre Dubrovnik, a lecture about Data Protection and Criminal Law has been held by Hannes Tretter, Co-Director of the Ludwig Boltzmann Institute of Human Rights and the Research Centre for Human Rights at the University of Vienna. The University of Josipa Jurja Strossmayer (Faculty of law, Osijek, Croatia) and the Faculty of Law University (Split, Croatia) invite under the international scientific conference, which will be held from 15th - 17th October in Split, Croatia, to the lecture of eo. Univ.Prof. Dr. Hannes Tretter about "The europeanisation of criminal law and protection of human rights in criminal proceedings and the process of execution of criminal sanctions". 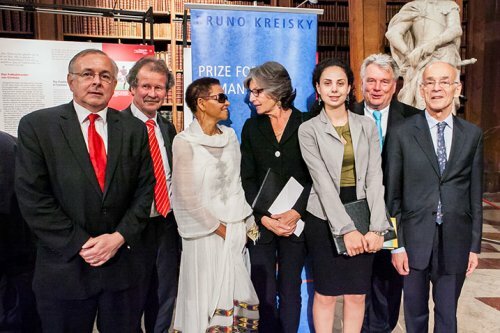 On the 10th of June 2013, at the Austrian National Library, the Bruno Kreisky Human Rights Prizes have been awarded for the 15th time. This year the awards were given to Mazen Darwish from Syria, Dr.in Bogaletch Gebre from Ethiopia and Cecily Corti from Austria. Who are we still allowed to take a photograph of? The Faculty of Law Vienna organised an event on the 13th of May 2013 about who we are still allowed to take photographs of and Hannes Tretter participated. Enclosed you will find the press review. Read more about Who are we still allowed to take a photograph of? Talk of Manfred Nowak during the official gala evening of the Sir Peter Ustinov Institut on 13 Mai 2013 in Vienna. The Seminar on Georgia and Peaceful Conflict Resolution, organised by the Eurasia Partnership Foundation in cooperation with BIM, held in Vienna on September 25, 2012 has brought together representatives from all three regions – Abkhazia, South Ossetia and Georgia, as well as experts – scholars and practitioners working on conflict resolution in Georgia. During the Seminar, Sabine Mandl and Christine Sommer, researchers from BIM, discussed "The role of women and civil society in peacebuilding". The event is held in German. Please switch to German Version on the website. From the rule of law to the state of surveillance? Hannes Tretter, director of the Ludwig Boltzmann Institute of Human Rights gives a lecture on the surveillance state at the 38th European Presidents' Conference - Vienna Advocates' Deliberations. Read more about From the rule of law to the state of surveillance?